Deutsch: George Walton Lucas Jr. (* 14. Mai 1944 in Modesto, Kalifornien) ist ein amerikanischer Produzent, Drehbuchautor und Regisseur. English: George Walton Lucas, Jr. (born May 14, 1944) is an Academy Award-nominated American film producer, screenwriter, director and founder/chairman of Lucasfilm Ltd. He is best known for being the creator of the epic science fiction franchise Star Wars and joint creator of the archaeologist-adventurer character Indiana Jones. Español: George Walton Lucas, Jr. (14 de mayo de 1944; Modesto, California, Estados Unidos) es un cineasta estadounidense, creador de la exitosa saga fílmica de Star Wars y posteriormente de Indiana Jones, presidente de Lucasfilm, LucasArts Entertainment Company, y Lucas Digital Ltd, Lucas Licensing, LucasBooks y Lucas Learning Ltd.
Français: George Walton Lucas, Junior (né le 14 mai 1944 à Modesto en Californie) est un des producteurs, réalisateurs et scénaristes américains les plus couronnés de succès des États-Unis. Il est surtout connu pour être le créateur de la saga cinématographique Star Wars. Italiano: George Walton Jr. Lucas (Modesto, 14 maggio 1944) è un regista, sceneggiatore e produttore cinematografico statunitense. È famoso soprattutto per le saghe di Guerre Stellari e Indiana Jones. 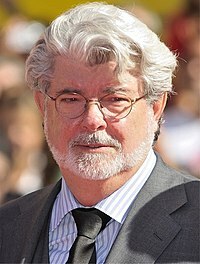 Nederlands: George Walton Lucas jr. (Modesto (Californië), 14 mei 1944) is een Amerikaans filmregisseur, filmproducent en schrijver. Polski: George Lucas, właśc. George Walton Lucas Jr (ur. 14 maja 1944 r. w Modesto, Kalifornia) - amerykański reżyser, producent i scenarzysta. Português: George Walton Lucas Jr., (Modesto, 14 de Maio de 1944) é um diretor de cinema norte-americano famoso pelas franquias Star Wars e Indiana Jones. Svenska: George Walton Lucas Jr., född 14 maj 1944 i Modesto, Kalifornien, är en amerikansk filmregissör, manusförfattare och filmproducent. Беларуская (тарашкевіца)‎: Джордж Ўолтан Лукас-малодшы (нарадзіўся 14 траўня 1944) — амэрыканскі кінапрадусар, рэжысэр, сцэнарыст, заснавальнік і старшыня «Lucasfilm Ltd.» Найбольш вядомы як стваральнік эпічнай касьмічнай сэрыі «Зорныя войны» і сустваральнік археалягічна-прыгодніцкага пэрсанажу «Індыяна Джонс». Pages in category "George Lucas"
Media in category "George Lucas"
This page was last edited on 25 November 2018, at 18:21.